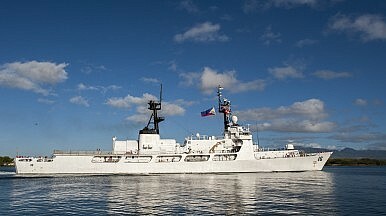 The Philippine Navy’s newest warship, the Hamilton-class cutter BRP Ramon Alcaraz (PF 16). The Philippines can only afford ‘frugal’ military modernization despite rising tensions in the South China Sea. The Philippine government is planning a 25 percent increase in the a portion of its 2016 defense budget dedicated to the modernization of the Armed Forces of the Philippines (AFP) in order to reinforce its military assets in the South China Sea, according to AFP. The AFP modernization program within the core Department of National Defense (DND) budget is set to increase from P15 to P25 billion ($552 million) in 2016. According to Florencio Abad, the current Secretary of the Philippine Department of Budget and Management, this would constitute the highest-ever increase in spending for military modernization in over two decades. The 2016 defense budget is expected to rise by 16.3 percent to P115.8 billion ($ 2.5 billion) with total defense spending – including unprogrammed acquisitions and pensions – set to increase to P174.6 billion ($ 3.8 billion), according to IHS Jane’s Defence Weekly. Abad told AFP that the proposed 2016 defense budget is part of a five-year, P75 billion military modernization plan approved by President Benigno Aquino Aquino in 2013; but this may not be enough according to data compiled by the Philippine Star, which indicates that a total of P90.86 billion will be needed to finance the military’s upgrade program until 2017. This data does not include around $50 million in direct military aid from the United States. [T]he acquisition of six close air support aircraft, P4.97 billion; multi-purpose attack craft project, P864.32 million; two C-130 aircraft, P1.6 billion; two naval helicopters, P5.4 billion; and lead-in fighter trainer jets ammunition, P4.47 billion. So far, 55 military upgrade projects worth P11.71 billion have completed since 2010. The military modernization program is partially driven by the ongoing territorial dispute between China and the Philippines in the South China Sea (West Philippine Sea). “We need to protect what is clearly within our territorial jurisdiction. Certainly, we need to at least be able to effectively monitor the developments in the area, particularly those in disputed zones,” Abad told AFP. However, Defense Secretary Voltaire Gazmin emphasized that there will only be limited budgetary resources available for the ongoing modernization effort. “The goal of updating and modernizing our armed forces is a long and painstaking process. That means we have to be frugal and acquire reliable platforms at very reasonable costs … as allowed by our meager financial resources,” he said. Is the Philippines’ Military Modernization Dead in the Water? The program seems to be losing steam under the Aquino administration. Who Will Be the Philippines’ Next Military Chief?Who is the Philippines’ New Army Chief?Japan and Philippines Sign Defense Agreement Amid Growing Tensions in South China SeaThe Truth About Philippine Military Modernization and the ‘China Threat’When Will the Damaged Philippines Warship Return?